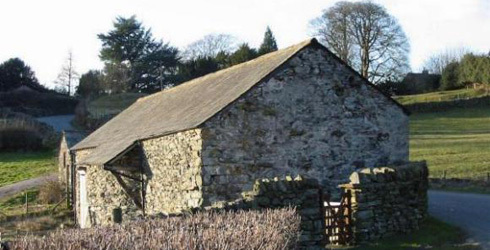 Rusland Tannery is situated south of Grizedale Forest, between Coniston and Windermere Lakes. Rusland itself is more a collection of hamlets rather than a discrete village, and the tannery lies east of Rusland Hall on the road from Haverthwaite to Satterthwaite . The site is in the care of the National Park and the grounds are open to the public, with access via a small gate and steps from the road. The tannery is a long, narrow, two-storey building, running roughly east-west, and built into the slope behind in the manner of a traditional bank barn, which it may originally have been. This means that the upper storey on the north side of the building is at road level. The tanyard lies on the south side, across which runs a stream, which emerges on the east side of the building from a culvert under the road and fields to the north. This then flows out of the tannery grounds as a tributary of the Rusland Pool, flowing south to join the River Leven. The building was probably constructed in the mid 18th century – there is certainly evidence that it was there in 1762 – and extended at a later date, probably in the 19th century. At this time the original south wall was modified (with a convex curve) to accomodate a horse-driven bark mill. It was a “heavy leather tannery”, supplying the leather for such as boot uppers and soles, harness, and strong straps. Tanning is a lengthy and skilled operation, involving a number of processes from cleansing and preparation of the hide, through the tanning sequence itself, to the drying and finishing of the leather product. The hides were first thoroughly washed to remove all traces of blood which would disfigure the leather. This could be done in a water pit or – in the case of Rusland – in the stream itself. This also had the effect of swelling up the fibres of the hide, bringing them back as near as possible to the condition in which they left the animal. This was a back-breaking task, with an average cowhide weighing 50 pounds dry and much more when wet. This process was designed to loosen the epidermis, fats and flesh which adhered to the central layer (the corium) of the hide. The hides would be suspended by chains from iron bars at the side of a number of pits which contained an increasingly strong solution of slaked lime mixed with water. The length of time given over to this process depended not just on how long it took to loosen the unwanted material, but also on the quality of leather required – softer leather would soak in a more mellow solution for a longer period of time. Sole leather spent 8-10 days in a strong solution, harness leather 12-14 days in a mellow solution, and leather for soft uppers perhaps 6 weeks in a weak solution. At Rusland there is evidence of two pits – about 1.5m square – just south of the stream. This process was carried out by the beamsman in a beam house. The wet and heavy hide was thrown over the beam – a working table with a convex and steeply sloping surface of wood or iron or (unusually as at Rusland) stone (Penrith Sandstone in this case). Unhairing was carried out with the hide flesh side down, using a knife with a blunt concave blade to remove the hair, which then became a useful by-product for use in mortar, upholstery and cheap clothing. Fleshing was a more skilful task carried out on the reverse (inner) side, using a sharp double-edged two-handled knife to remove the fleshings, which could themselves be processed elsewhere into glue and gelatin. At Rusland two beams have been rebuilt in their original location close to the eastern boundary wall. There is evidence that this side of the site was roofed over to provide some protection for what was an unhealthy and unpleasant task. The heavier hides – as at Rusland – were then thoroughly washed, and any remaining lime squeezed out with a “scudder” – a blunt curved knife with a slate blade – and the grain raised in a weak acid solution. Lighter hides went through a much more obnoxious process, being soaked in mastering pits in an acid liquor of, for example, a mixture of dog dirt and warm water, before being thoroughly washed. Before tanning itself began, the hides would be cut into several parts – a process known as rounding – to separate the various qualities of skin with different absorption rates and intended uses. The liquor in which they were soaked would be prepared in leeching pits, where the ground oak bark would be allowed to stand in water for up to some weeks to produce various strengths. For a number of days suspended in a weak solution, the hides tied to strings laid across the top of the pit. The hides must remain separate from each other, as touching would result in marks and uneven colour. For 6 to 8 weeks in a series of pits called handlers or floaters. In these the hides would be laid flat, and turned over 2-3 times a day so that the liquor penetrated the hide fully. For up to 18 months in “the layers”. The hides were laid flat, one on top of the other with ground bark in between them, and strong liquor added to the pile. This process could be repeated in new pits with stronger solutions as required. At Rusland you can see the remains of 6 or possibly 8 slate and timber lined tan pits in the floor inside the eastern end of the building. They are laid out either side of a narrow cobbled path with a central drain which ran to the doorway. At Rusland the 19th century extension to the building could have housed either more space for bark storage or a drying room, in which case the open north and south walls would have been louvred. This was the final operation, involving skill and precision, where the leather was cleansed, split and softened ready for its final use – to produce leather for harness or shoe uppers for example. At the time Rusland was in operation this was an entirely separate process, and the dried leather would have been sent on to the currier. Later it was carried out before rather than after the drying process.